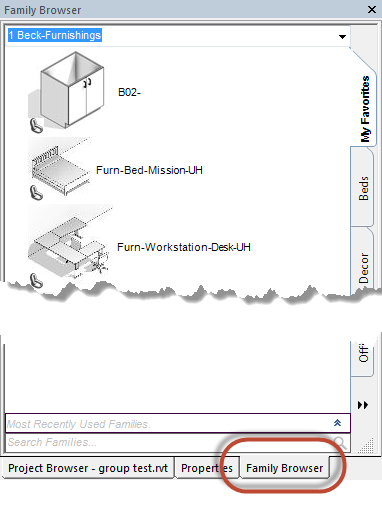 Family Browser now fully Integrated into Autodesk Revit 2014 - 1st Sept 2013. We are very proud to announce that from today Family Browser is now fully integrated into Autodesk Revit 2014 software. 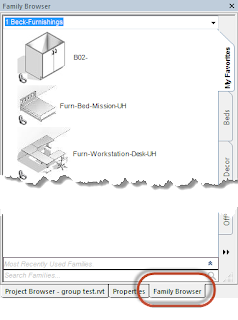 Users now have the ability to run Family Browser in "Classic Mode", as per the existing Family Browser floating mode, or have it docked within the Autodesk Revit user interface. Running Family Browser in the docked state integrates Family Browser seamlessly into the UI, which can then be docked left,right, top, bottom and as a tabbed item along with the Project Browser etc. Family Browser will start-up automatically on Revit start and remember the previous position and state it was in. Our studies have shown that users are far more likely to use an application if it is always open and even more so if they don't even realise they are using an external application. PLEASE NOTE: Web Update 1 must be installed first for this feature to work. To view this feature in action see video below. 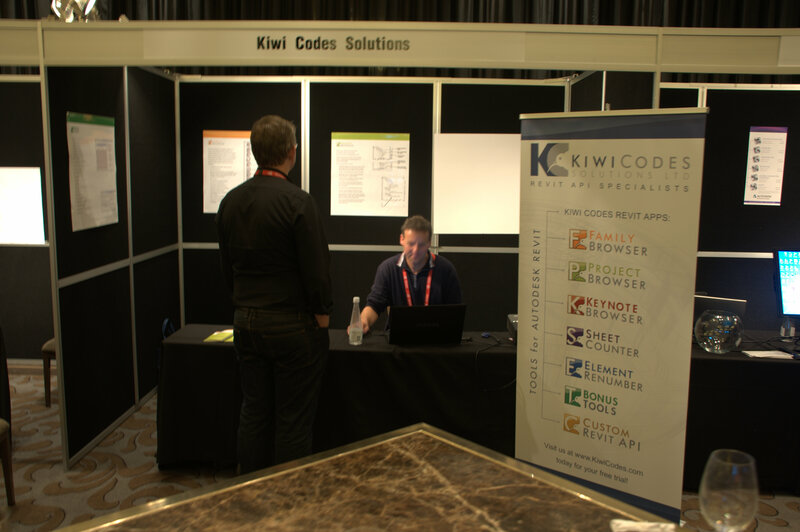 Kiwi Codes has had a very successful time exhibiting at RTC AUS at the “Langman Hotel” in Auckland New Zealand , 16th to the 18th May. It was great to catch up with allot of our existing Australasian clients and get their feedback on how they are using our time saving Revit tools and also hearing their fantastic suggestions for future enhancements to our existing tools and also new ideas for other tools. It was also great to showcase our tools to others who as yet are not our clients. Do you offer Network/Floating licensing model for your tools? It would be great if Family Browser showed the currently loaded families in the current project as a separate group like what KC Project Browser does. How can we buy all of your products at once as a suite package? Are you attending RTC NA this year? The good news is that items 1 & 2 are going to be addressed in a new build of Family/Project Browser by the 31st of May 2013. Keep an eye on our web site for the new build/features this Friday. A suite license is something will address a little further down the track. We need to change around our licensing a little to allow a single key to unlock selected features, but it is all possible. The real exciting news is that, Yes we are attending RTC NA in Vancouver Canada on the 11th – 14th July 2013. North America is our biggest customer base and we are really excited to meet face to face our existing customers. If you are there make sure you find some time to visit us at Booth #21 for a catch up. We are very pleased to announce the strategic partnership between Kiwi Codes Solutions and the leading design, architecture, engineering and planning firm, HOK. HOK have this week announced a global roll-out of Project Browser and Family Browser throughout their firm. With this alliance, Kiwi Codes will gain valuable insight into the complexities of Project and Family management across a global firm, while HOK gain instant productivity gains through Project and Family Management, like no other Revit Addin on the market does. These developments mark the beginning of an exciting era for Kiwi Codes Project and Family Browsers. Over the last few weeks there has been a bit of a rush on our Sheet Counter product which has been fantastic. Because of this I thought it would be timely to do up a tutorial video on how it actually works. Let us know if you find this useful or have any other suggestions how we can improve this simple but useful tool. Don't just take our word for it. Family Browser IS FANTASTIC and saves you a ton of time. Adam Simmons from Gensler reviewed Family Browser at the latest Autodesk University 2012 in Las Vegas recently and below is the screen cast from his presentation regarding Family Browser. Thank you Adam for taking the time to try and review Family Browser. A few weeks ago we updated both Family Browser and Project Browser with an advanced search function that can search by family Name, Family Type, Parameter Type, Name and Value. I have included below two YouTube video to show how easy this function is to use. Recently Steve Stafford of Revit OpEd and James Herndon from TheRevitBlog has just recently blogged about different ways to show graphically views which are placed on sheets in the Revit Project Browser. While these ways are a valid way of achieving that task we believe that with Kiwi Codes Project Browser we have a much more elegant and visual way of achieving this. This YouTube video shows just how easy it is in KC Project Browser. You may have noticed in the latest build of our products that we are now using flash new installer software. We have done this to be more Windows compliant and certainly helps with the Family/Project Browser deployment and uninstall etc. One side effect that this has caused is the new Parameter values required to install our Apps Silently. Instead of the "/s" switch this has now changed to "/qn ALLUSERS=1" for example you would run "FamilyBrowser-1-10-15-1.exe /qn ALLUSERS=1" from DOS or a VB script at user login to install Family Browser silently for all users. Email us if you have any questions regarding this. Sheet Counter is a simple automatic sheet counter for Revit 2013 which counts how many sheets are in the project and numbers the sheets ie sheet 23 of 97. You can remove, exclude or add sheets and Sheet Counter will automatically renumber the sheets for you. The most fantastic part about the search is the real-time instant updates of complying families, shown graphically within the search tab. 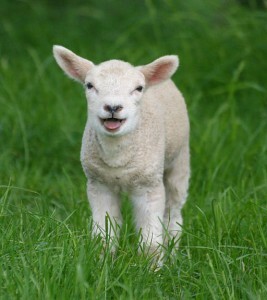 Well at last the days are beginning to lengthen out and warm up in the southern hemisphere. So if you have been sitting on the fence or just upgraded your Revit version to 2013, make sure you don't miss out on the fantastic limited time deal. Another Enhancement/New Feature that has just been added to Family/Project Browser is a new "Recently Used Families" expander bar at the bottom of Family Browser above the search bar. This expander replaces Revit Component Type Selector which also lists the most recently used families, but in a more convenient location. Thanks Dave Baldacchino do-u-revit.blogspot.com for this suggested feature. Over the last two years we have had a few comments from people that, especially when creating tabs for Detail components that there ends up with allot of tabs. Even with careful organization of Groups this can still happen. It has been suggested if we could have sub tabs within tabs to try and get another level of organization and flexibility in Family Browser. Well your wishes have now come true in Family Browser 2013 with the ability to add sub folders to tabs. These are totally user customizable to as many levels deep that you require. They can also be cross referenced in more than one tab. Check out this video below that explains how this is done. We receive allot of feedback from our customers with features that they would like to see and enhancements to both Project Browser and Family Browser. Sometimes these ideas are a simple thing for us to include. Two of these requests have been added to the latest download of Project Browser. Pin/Unpin Graphic - We have always been able to pin open or unpin FB & PB by double clicking on the spine. This has not been obvious to all so we have included a Pin icon for this. There have been a few requests to be able to reorder tabs within Project Browser, especially to get Family Tab which launches Family Browser down to the bottom. You can now reorder the common tabs within Project Browser to whatever order you like. At this stage you cannot custom order Query tabs. To see this in action watch the video below. Kiwi Codes Family Browser has a feature article by one of our medium sized firms, BECK Group (http://www.beckgroup.com) out of the USA in the latest AUGI World Magazine. Thank you Aaron Maller for the wonderful article on how you have implemented Family Browser through out your company (5 sites) and the huge benefits that you are gaining from using Family Browser. Check out page number 38 for the article by Aaron. Well the wait is finally over for those of you waiting for Element Renumber. I have now rebuilt it so it is now compatible with Revit 2013. The trial download can be found on our Products page HERE. Over the past we year we have had a few enquiries about how to add icons to family types within Family Browser. This is most commonly asked when a family has totally different geometry per type within the family. Revit can’t do it and we can’t generate an image from the API for this. There has been a recent discussion over at RFO - Link Here, discussing this very topic. Well the good news is that within Family Browser we can now do this. 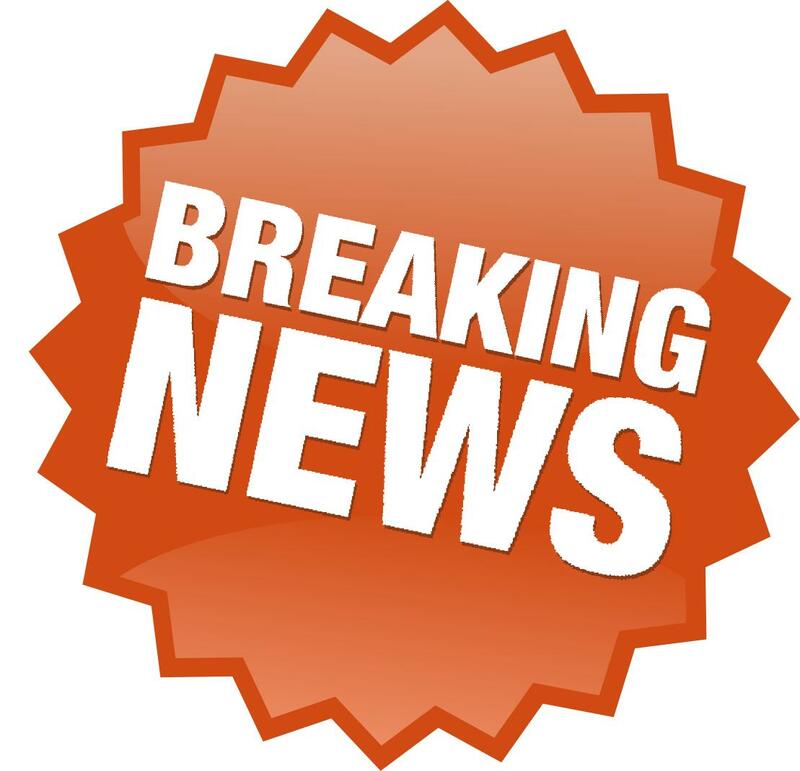 You will need to download the currunt release of Family Browser/Project Browser from our products page for this to work. Below is a video showing just how simple this is. Over the last year we have had a few requests from clients wanting a simple way of re-organizing their existing Family folder structure into folders based on the Family Category, ready to be used in Family Browser. Well I have just inbuilt a function into Family/Project Browser that does just that. Please view the video below to see how easy this is. You will need to download the latest version of FB/PB for this to be available.